The Portable Edgebanders offered by Shop Gear Inc. can be used in the hand-held setup by running the edgebander by hand around your work piece or in the stationary setup by placing it in a compatible table and running your work piece through the edgebander. Used by both small and large shops, this handy machine is used in a variety of ways and for many different applications. Despite the uniqueness of each woodworker’s edgebanding needs, a few basic guidelines will help you determine whether you should use this edgebander in the hand-held or table setup. If the wood you are edgebanding can be edgebanded in the table setup, DO IT. The clamping system works fine and produces the same quality, so it is important to note that this recommendation is based completely on time and simplifying the edgebanding process. The rest of this article will provide basic guidelines for identifying whether or not the wood you are edgebanding can be ran in the table setup or needs to be ran in the portable (clamp) setup. Most of the woodworkers who use the Portable Edgebander for straight edgebanding run it in the table setup with the ST97 Fence Attachment (if running straight edgebanding in the table setup, make sure you have the ST97 Fence Attachment). The clamping system works fine, (on smooth, non-porous material) but all straight work pieces can be compatible with the ST95A Table. Some edgebanding projects call for edgebanding larger pieces of wood that can be too large to run through the ST95A Table by itself. The solution is manufactured tables, which can be placed on the in-feed and out-feed side of the ST95A Table which make virtually all straight pieces compatible in this setup. Almost any piece that can be edgebanded in the table setup can be edgebanded in the hand-held setup, but if compatible, edgeband in the table setup. 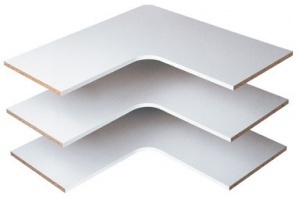 If the wood you are edgebanding comes in a variety of shapes and sizes, having both the clamps and table is preferable by providing you the flexibility to edgeband in both setups.